I am actually surprised at how long it's taken me to reach 100 posts. All I ever do is talk about my horses, apparently I don't feel the need to write about them as much. Anyway, here it is, my 100th post! Yesterday was Artemis day. We did a lot with her, especially considering all I had planned to do with her was lead her around a bit. I've healed enough to be able to lead her around a bit, so while my mom rides that's usually what I do. The first time I had to remind her she does have to listen to me, apparently she forgot. We decided to put the bit in her and get her used to having that in. She chewed it, a lot but that was expected. 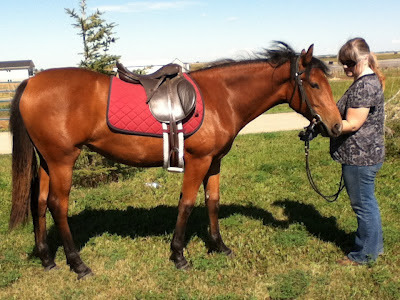 After a while L really wanted to see her with the english saddle on so we decided to put it on. She was great. One of the things we're working on with her is standing at the mounting block quietly while I stand on it. It's going very well. She doesn't move. Yesterday I put my leg on the saddle and nothing. I put some weight in the stirrup and she stood perfectly. Hopefully by the time both of us are ready for her to be ridden, she won't have a problem with any of it. Fonda was like that and I hope to get her the same way. While watching my mom ride I decided to try something out I'd read in one of my dad's old Western Horseman magazines from the 70's/80's. It was about teaching a yearling to neck rein from the ground. It's very similar to teaching them when on them, only modified a little bit. Artemis did great. I pulled the reins against her neck, and them put slightly more pressure on the inside rein, if I wanted her to turn to the inside. At first she thought I wanted her to back up but after a few tries she understood. She'd take a step and I'd let her stop and pet her. I was also able to get her to back up very easily from rein pressure and telling her to back up. After my mom finished riding we took Artemis and Jimmy for a walk. We're trying to reinforce proper leading with them so we take them on walks around the stable. She was good until we put Jimmy in the pen to eat grass and led her away. She didn't like that but she calmed down pretty quickly. To finish the day we unsaddled her and then led her into the wash rack. We didn't wash her off, I'm just happy right now if she'll stand in it quietly. And she did. She snorted a lot and smelled the rubber mats but she was fine. I didn't want to fry her mind though so we ended the day there. She was a superstar. Beware of bragging, but I can't believe how easy-going and good-minded she is. She's okay with anything I do to her, she might not like it, but she's willing to try it out. Apparently she had a little escapde on Sunday. We weren't there but T and E told us all about it. They're haying at the stable and they needed to get all the tractors through the pasture where Artemis and the other pasture horses are. So they wouldn't escape they wanted to put them in the field beside the outdoor arena. 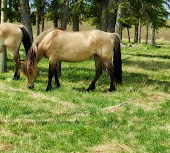 They led most of the horses and figured the young ones, Artemis and Ebony would follow, since they usually are happy enough to follow behind their herd. I'm actually a little foggy on the details and need to ask T again to explain it all to me, but Artemis decided not to follow. She had a little run around the farm before going in the field. Then, a while later, S, one of the boarders, came running up to T's house to tell them that a horse had gotten out. Yeah, somehow Artemis managed to get out, breaking a railing while she was at it. 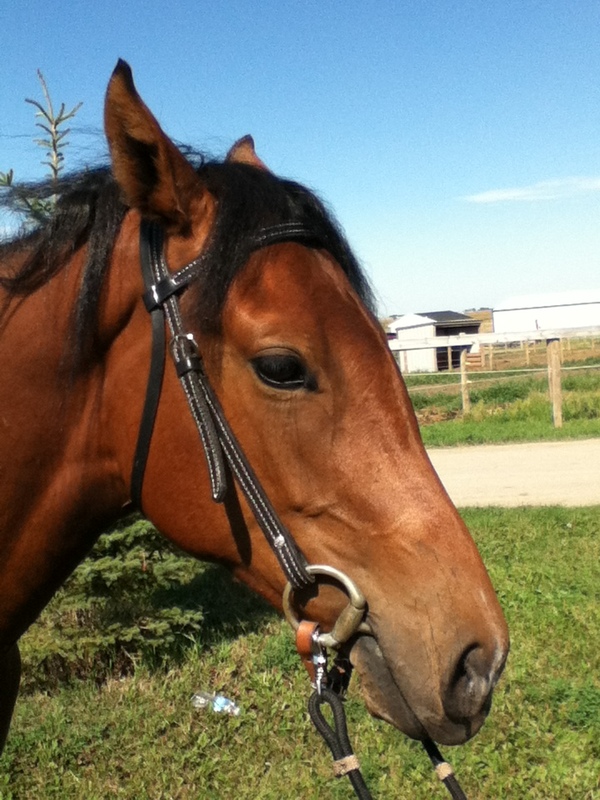 She had another run around the stable, and in the parking lot before S caught her. Then Miss Artemis spent the night in the round pen alone feeling shame. S caught Artemis I guess because T and E were a little nervous to. I find it amusing, they've known Artemis since she was born but really, I can't blame them. They know we lead her but they've never actually seen how she is to lead. They can't afford to get hurt and I'd be horrified if Artemis or the other two hurt them. Next time I see S though, I'm going to have to thank her and ask how Artemis was for her. No one besides my family has ever led her so I hope she was good.